This is just the thing for the December birthday girl. 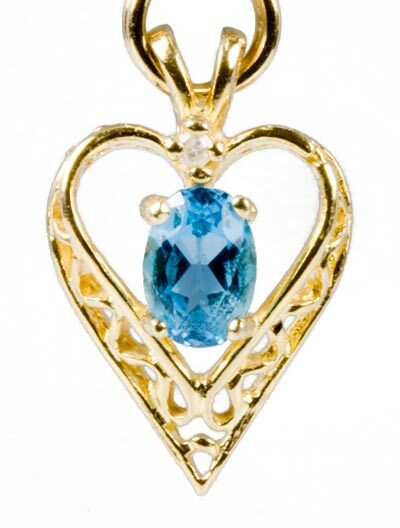 A lovely blue topaz of about 0.50 carat is suspended inside a lovely filigree gold heart. And to top it off, a small (approx 0.02 carat) round cut diamond is set directly above the main stone. This heart could be used equally well as a charm or a pendant. Tests 14K. 17.7mm (0.70in.) tall, including the bail. Weight 1.4 grams.